1974 marked the genesis of a group destined to stamp an indelible imprint on rock music. The group was Rush, three talented young men from Canada. Their debut album was characterized by a direct, thundering energy which was never to abandon them. Shortly before the release of their second album, Fly by Night, drummer Neil Peart joined Alex Lifeson (guitar) and Geddy Lee (bass, vocals). The integration of Peart into the band proved to be a milestone. His lyrics ushered in a new side to the music. The sound became more mystical. Lyric content of such depth and complexity had never before been mined by a high-energy group. The idea was surely experimental and perhaps at the margins of revolution. The more the group evolved, the more sophisticated the ideas became. Concept album after concept album rushed from their fertile minds. Caress of Steel with its soul searing quest. 2112, a hugely successful sci-fi album speculating on future societies and their political architecture. Next, A Farewell to Kings, a pulsating, elegiac mourning of individuality's demise. By now, Rush had become storytellers of the first water [sic] - and clearly the most challenging and cerebral of all the hard rock bands. With premises rooted in objectivism, each album bore a message-saturated story on one side and surging, high-powered, energy-flooded, hot-blooded rock n' roll on the other. 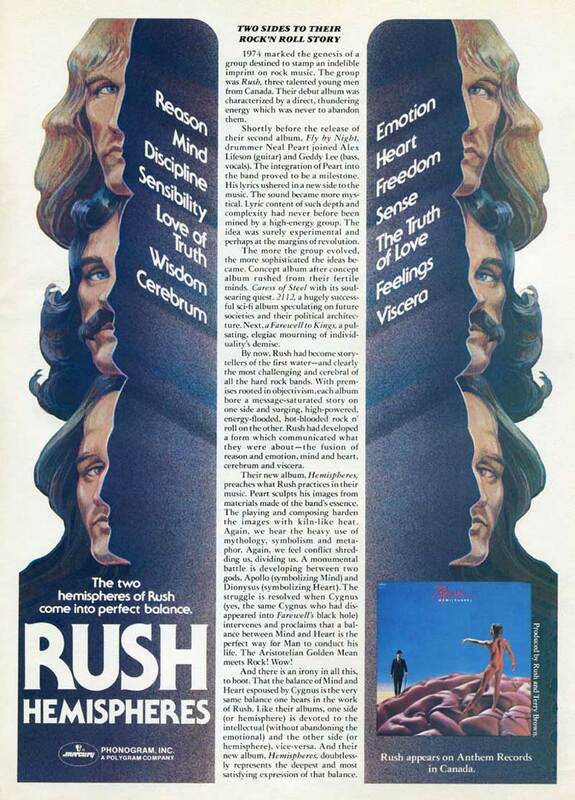 Rush had developed a form which communicated what they were about -the fusion of reason and emotion, mind and heart, cerebrum and viscera. Their new album, Hemispheres, preaches what Rush practices in their music. Peart sculpts his images from materials made of the band's essence. The playing and composing harden the images with kiln-like heat. Again, we hear the heavy use of mythology, symbolism and metaphor. Again, we feel conflict shredding us, dividing us. A monumental battle is developing between two gods, Apollo (symbolizing Mind) and Dionysus (symbolizing Heart). The struggle is resolved when Cygnus (yes, the same Cygnus who had disappeared into Farewell's black hole) intervenes and proclaims that a balance between Mind and Heart is the perfect way for Man to conduct his life. The Aristotelian Golden Mean meets Rock! Wow! And there is an irony in all this, to boot. That the balance of Mind and Heart espoused by Cygnus is the very same balance one hears in the work of Rush. Like their albums, one side (or hemisphere) is devoted to the intellectual (without abandoning the emotional) and the other side (or, hemisphere), vice-versa. And their new album, Hemispheres, doubtlessly represents the deepest and most satisfying expression of that balance.